Background/Purpose: GO-REVEAL is the first study evaluating outcomes of anti-TNF tx in active PsA through 5 years. Safety and efficacy, including radiographic progression in golimumab (GLM) tx’d patients (pts) from the long-term extension of GO-REVEAL is presented. Methods: 405 adult PsA pts (≥3 swollen, ≥3 tender joints) were randomized to SC injections of placebo (PBO, Grp1, n=113), GLM50mg (Grp2, n=146), or GLM100mg (Grp3, n=146) q4wks through wk20. Concomitant MTX at baseline was allowed but not required. Starting at wk16, PBO pts with <10% improvement in swollen and tender joints received GLM50mg, remaining PBO pts received GLM50mg starting at wk24; all pts received GLM from wk24 forward. After wk52, pts could change the dose from GLM50 mg to 100mg based on investigator judgment. The last GLM injection was at wk 252. 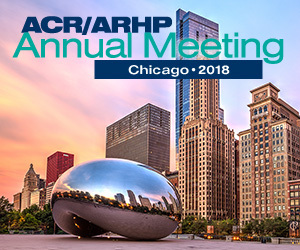 Efficacy was assessed at wk 256 based on randomized grp and completer analyses using ACR response criteria, DAS28-CRP, PASI, HAQ, enthesitis, dactylitis , NAPSI scores, and the PsA-modified Sharp/van der Heijde Score (SHS). Safety evaluations included all pts who received at least one GLM dose through 5 years. Results: Of 405 pts randomized, 335 continued in the study at wk104, and 279 pts (69%) continued GLM tx through wk252. 29% of Grp2 pts dose escalated to GLM100mg; 25% of Grp3 pts decreased the dose from 100mg to 50mg. Baseline characteristics of pts who continued in the study at Wk 104 are provided in Table 1. Efficacy results are presented in Table 2. ACR and PASI responses were similar in pts tx’d with or without MTX; changes from baseline in SHS scores were minimal and numerically less in pts tx’d with GLM and MTX compared with GLM alone. Overall, 88%, and 21% GLM tx’d pts experienced AE and SAE, resp. 12% of pts discontinued GLM tx due to AE, and 5% and 4% pts experienced malignancy (including NMSC), and serious infection, resp. Antibodies to golimumab were detected in 6% of pts. Conclusion: Pt attrition through 5yrs of GLM tx was low. GLM tx resulted in long-term maintenance of clinically meaningful responses in the arthritic and skin components of PsA, improved physical function, and arrest of radiographic progression. No apparent differences between long-term safety and efficacy of 2 GLM doses administered q4wks were observed, however the interpretation of the data is limited due the tx changes allowed across randomized grps. a Includes pts randomized to PBO who switched to GLM at wk16 or 24; after wk 52 pts could receive GLM50mg or 100mg. b Includes pts randomized to GLM50 mg; after wk 52 pts could receive GLM50 mg or 100mg. c Includes pts randomized to GLM100 mg; after wk 52 pts could receive GLM100mg or 50mg.